Nolan visited Italy in 1954 for a second time. He travelled extensively, fascinated by the religiousness and sense of antiquity that permeated its landscape and culture. 'Italian crucifix' is one of several paintings on the theme of a primitive crucifix that found its main source in the numerous wayside shrines of the south. Flanked by selected instruments of the crucifixion, Nolan's central image of a face in the shape of a palette is suggestive of both Christ and the masked bushranger Kelly, adopted in the previous decade as the artist's alter ego. Set against ancient architectural fragments and the arid coastline of Puglia in southern Italy, it conveys what Nolan had felt so strongly to be the Christian/pagan spirit arising from the Italian landscape. Signed and dated lower c., pencil "Nolan/ 15-4-44". Signed lower c., pale red synthetic polymer paint "n.". Sidney Nolan: such is life , Melbourne, 1987, 130, 132. NOTE: General reference. Art Gallery of New South Wales Annual Report 2002 , 'Director's Statement', pg.4-7, Sydney, 2002, 6, 7 (colour illus. ), 8. Sidney Nolan - landscapes and legends: a retrospective exhibition 1937 - 1987 , Sydney, 1987, 123. Peter Hill, The Sydney Morning Herald , 'Mix 'n' match', pg. 18, Sydney, 15 Jan 2005-16 Jan 2005, 18. Spectrum supplement of Saturday's edition. Nolan's Nolans: a reputation reassessed , London, 1997, 48, 49 (colour illus.). cat.no. 49; dated 1955; priced £60,000. Clare Morgan., The Sydney Morning Herald , 'Gallery sells off the family silver and strikes gold', Sydney, 21 Dec 2004. 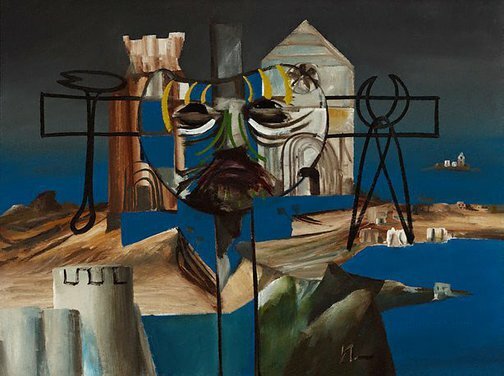 Sidney Nolan , 'Chapter nine: Nolan the nomad', pg. 173-187, London, 2002, 173,174, 175 (colour illus. ), 176. Jill Skyes, Look , 'Doing justice to Nolan', pg. 8, Sydney, Mar 2005, 8. The Australian , 'Nolan the nation's "greatest painter"', Sydney, 19 Dec 2004. NOTE: This article also appeared in Melbourne's 'Herald Sun' and 'Daily telegraph', Adelaide's 'Advertiser' and Brisbane's 'Courier mail', on 19 December 2004. Whitechapel Art Gallery, Sidney Nolan: catalogue of an exhibition of paintings from 1947 to 1957 , 'The Italian paintings', London, 1957, 16. Sidney Nolan , London, 1961, 140. NOTE: General reference to Nolan's painting on this theme. Related photograph 'Crucifix, Southern Italy', 1954 on page 42.